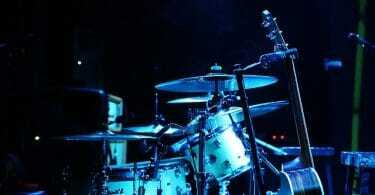 What’s the best electronic drum set for you? Let’s dive in and take a look at the best electronic drum brands to compare. Do you need an electronic drum set with built-in Bluetooth connectivity? Do you need mesh heads, or rubber? 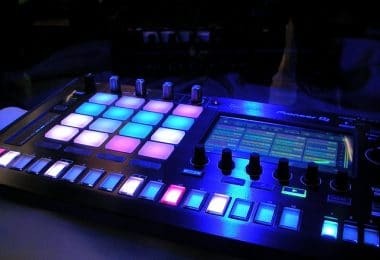 Do you need MIDI capability? You probably have a lot of questions. 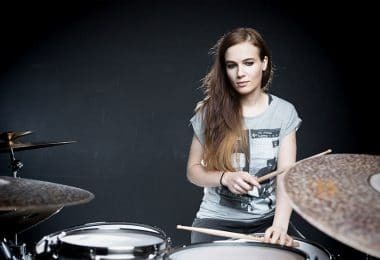 Don't worry, we'll answer some of those questions and look at the very best electronic drum sets available in 2019, breaking down and identifying the very best set for you. Whether you're on a budget, looking for portability, or want the very best electronic drum set available on the market today, you'll find it here! We’ll start our review of the best electronic drum sets of 2019 with the all new Alesis Nitro Mesh kit. In terms of affordability, play, feel, and sound, you'd be hard-pressed to find a better beginner electronic drum set than the Alesis Nitro Mesh kit. Mesh heads! 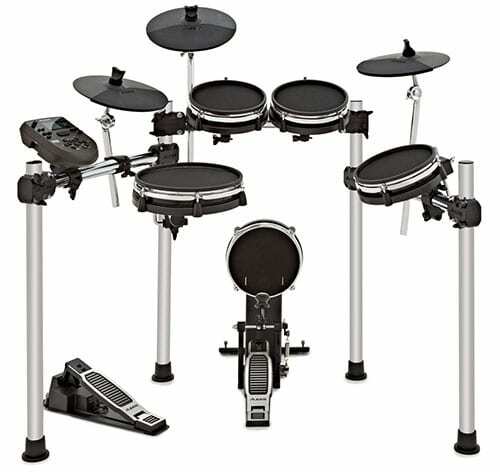 This electronic drum kit comes with three 8” mesh toms, which makes you feel like you're playing on an acoustic drum set. The sound module comes complete with 385 drum and cymbal sounds, distilled into 40 complete drum kits. The kit also comes at with 60 built-in tracks that you can play along to. Get better faster! Rock in or rock out. With audio outputs, you can plug the Alesis Nitro Mesh set into an external speaker system to rock out. Or, you can use the included headphone jack and practice and play in complete silence. Be kind to your neighbors! Studio compatibility. The Alesis Nitro Mesh drum kit comes complete with USB-MIDI and MIDI in/out capability to connect to your computer or recording workstation and allow for incredible audio expandability. The DTX400 comes with 10-inch cymbal pads alongside four rubber drum pads which allows you to play in relative silence and not disturb others. The drum rack is adjustable and fully customizable for each and every drummer, big or small. Import MIDI songs to the trigger module as well as download free MIDI songs upon purchase. Connect with the DTX400K’s iOS app and play along with video drum lessons and performances, customize kits, and learn with and practice alongside your favorite songs and styles. The DTX400 rack components, drum pads, cymbals, and hardware are all designed and produced with Yamaha’s attention to detail. Very durable and dependable. 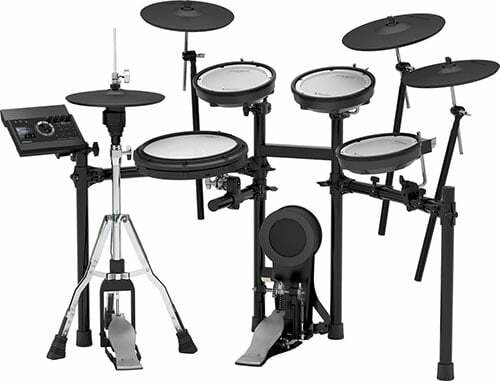 The Alesis Surge Mesh Kit is a complete eight-piece electronic drum set. The set comes with a 10-inch dual-zone mesh snare, 38-inch dual-zone mesh tom pads, a mesh kick drum, and three chokeable cymbals. It's literally everything you need! The Surge drum module comes complete with 40 different drum kits and almost 400 different sounds. The unit also comes with onboard effects and internal songs to play along to. Compatibility! You can connect your phone, MP3 player, nearly any auxiliary audio device to the Surge drum module. With onboard MIDI included, you can connect to your computer or recording interface and utilize additional sounds. Portability. Perhaps the greatest attribute of the Alesis Surge Mesh set is its collapsible chrome four-post mounting rack. If you're on the go, have an impromptu rehearsal, or need to bring a reliable kit to a recording session, the Alesis Surge Mesh is entirely collapsible, making it a breeze to bring your drums with you wherever you may need them! While other brands are making some strides in their product research and development, Roland still stands head and shoulders above the competition. With a large 12-inch mesh snare and acoustic cymbal hi hat, the TD-17KDX allows even the most discerning drummer unlimited capability. With sounds and drum kits modeled after Roland's flagship TD-50 sound engine, this kit plays and sounds like a kit that costs thousands of dollars more. 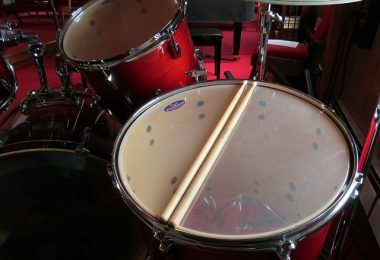 The included coaching mode emphasizes fundamental technique, groove, tempo, and timing. No need for external motivation, this kit will get you on the right track to becoming a steady drummer in no (pardon the pun) time at all. Play with your favorite bands or get ready for an upcoming show. With the TD-17's Bluetooth capabilities you can listen to entire songs through your Bluetooth headphones. The onboard recorder even records your performances and let’s you listen back to them to see how good, or how really good, you really are! Load in your own samples and mix them with the sounds in the module to get the exact kind of sound you want. From the top down, Roland V drums are designed to be reliable. 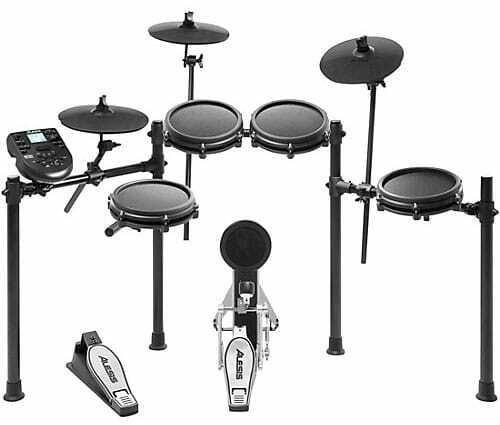 Night in a night out, you can trust that your TD-17 electronic drum set will perform whenever you need it to. 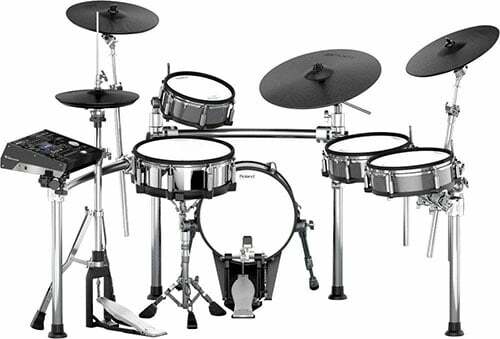 Fully expandable, there are no limits to your imagination with this drum set. The best parts about the TD-17KVX by far are its ease-of-use, amazing sounds right out of the box, and Bluetooth functionality. It has never been easier to dial in the exact kind of kit you want, without having to get lost in a million menus. It's so great that it makes me crave playing much more often, and that is a great feat for any product. Roland’s line of electronic drums are generally considered the best electronic drum sets on the market today. Own a piece of this storied legacy with the compact yet powerful TD–1KV. With its superior modeling, sturdy construction, and tech savvy digital interface, you can have the chance to join the Roland family at a relatively low price point. With a simple and clear layout, the TD–1KV drum module is a cinch to use. Borrowing from the advanced sound engine of the Roland’s TD–30, this unit delivers exceptional acoustic sounds and responsive playing capabilities. With its tiny footprint, the TD–1KV fits anywhere in your home or studio. The rack itself is easily adjustable, easily accommodating children and or adults alike. Cymbal height and drum pad height are also adjustable which means you have complete control over how your drum kit is set up. With its built in USB–MIDI interface, the TD–1KV can communicate with any music software via USB cable. With this type of connectivity, you can jam with others, practice with various resources, the possibilities are limitless. The Roland V drums tutor software is built directly into the TD-1KV. Whether you're learning to play, studying frequently, or trying to get back into playing the drums, the V drums tutor is an incredible resource and comes standard with the TD–1KV. Access to the Stephen Slade five drum library featuring 24-bit multichannel drum samples recorded in world-class studios utilizing the most cutting-edge recording equipment available today. Fully adjustable, the module supports adjustments to attack, sustain, release, tune, pan, and volume. The module also has onboard effects and microphone modeling which is especially handy in recording environments. The MIMP24B features a 7-inch intuitive touchscreen which makes selecting kits, adjusting parameters, browsing menus, or adjusting the mix of your sound the snap! Gone are the days of faders and knobs, just touch and go! The module comes equipped with a 16 trigger inputs, 16 audio outputs, and a 120 GB solid-state drive which means you will more than likely run out of ideas before you have space to put them! Lastly, the unit has a dual audio engine to assign sound for front of the house and headphone monitoring, an invaluable tool in live drum applications. The heart of the Roland TD–50KV, the TD–50 module, features prismatic sound modeling. Quite possibly Roland’s most impressive module, the new advanced processor features new snare and ride pads, top-of-the-line tom, crash, and hi hat pads, alongside incredible editing features which allow you to tweak each individual drum to your heart’s content. The really is no limit to the editing capabilities of this module! The TD–50 also comes with Roland’s new PDE–140DS, a digital snare pad featuring a three-layer mesh head, which both feels and sounds like a natural snare. The TD–50’s module picks up even the most minute brushstrokes, capably deciphering every nuanced aspect of your drum playing style. Loud or soft, this drum kit picks up everything. The TD–50 comes complete with some of Roland’s top-of-the-line cymbals. 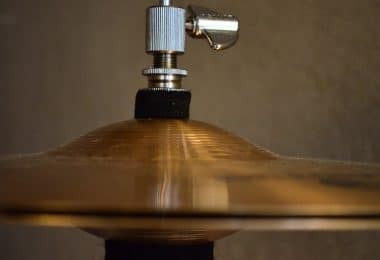 In combination with the TD–50 drum module, the cymbals easily detect every drum stroke from edge to bell, delivering dynamics and response unmatched with other available drum modules. Playing the Los Angeles Coliseum? Opening act at your local bar? Recording in a studio? No problem! The TD–50 offers a plethora of onboard kits for you to use that are perfect regardless of the location. Take control of every facet of your drum heads and cymbals, with compressors, and a three band EQ, you have complete control over every one of your drums which means, wherever you’re playing, you’ll sound your best! An intuitive drum module that offers a total of 691 drum and percussion samples and 128 keyboard voices. There is also ample space for user designed kits, samples, and additional sounds available via third party VST developers. USB compatibility ensures access to existing libraries of drum sounds as well as expandable sound samples. The DTX562K’s silicone drum hundreds really do allow for near silent playing and practicing. Have an idea or need to lay down a drum track at three in the morning? No problem with these drums. Feel free to rock out long after the sun goes down. Take advantage of the host of coaching functions available on this electronic drum set. Improve your skill, speed, and timing with the group check function. Play along with your favorite song or built-in song with the included playback and metronome function. 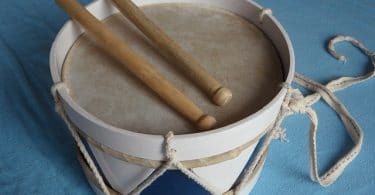 As you can see, 2019 is an incredible time to be a drummer, especially if you are considering purchasing an electronic drum set. 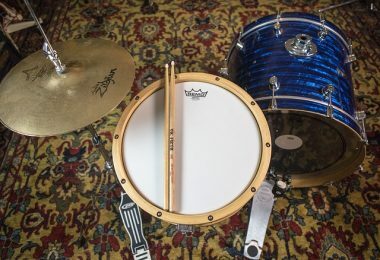 From small, light, and portable, to incredibly intricate and acoustic-like drum sets, there’s something for everyone available on the market today. Still can’t make up your mind? Let’s take a quick look at some of the industry leaders in the electronic drum set market to give you a better idea of which to choose. As we’ve seen, Roland not only makes the best sounding electronic drum sets, but also the most reliable. Night in and night out, you can count on the Roland TD series to deliver professional sounding drums that will take a beating and keep on ticking. With their wide variety of electronic drum products, there is literally something for everybody when it comes to Roland. 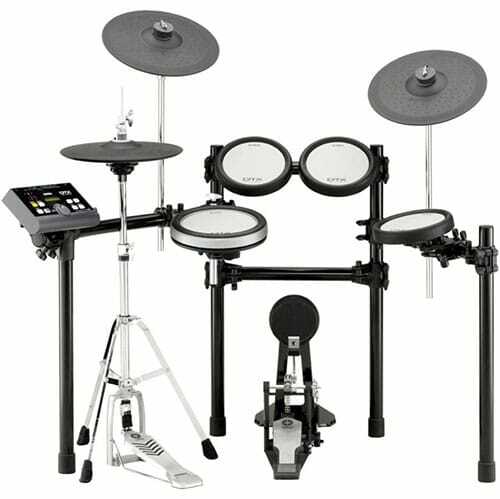 Like countless drummer before, take comfort in knowing that, when you buy a Roland drum set, you are getting the very best electronic drum set that money can buy. Perhaps not as widely recognized, Alesis has offered electronic drum products for over 30 years. 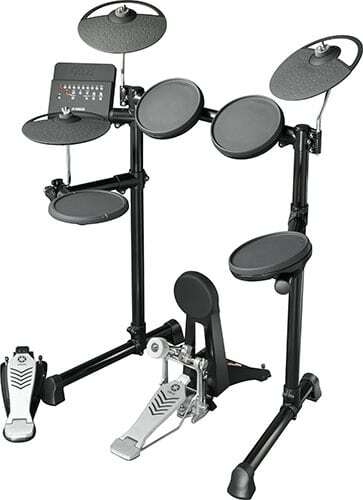 The company offers electronic drum sets, multi-pads, drum machines, and drum modules. 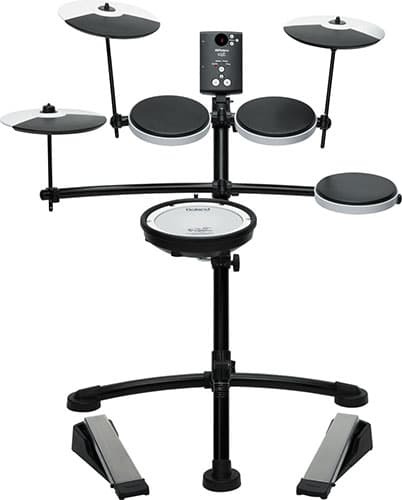 Being the small fish in a big pond does have some advantages however, as you can purchase an Alesis electronic drum set that has some of the same capabilities of Roland’s products at a fraction of the price. As covered above, the company’s “Nitro” line of electronic drums is especially noteworthy and deserving of your consideration when looking for an electronic kit. Not to be outdone, the acoustic drum-making-gurus Pearl have proved that they can hold their own in the electronic drum set landscape. Pearl’s e/MERGE set, in collaboration with Korg, presents an exciting new direction for the company and promises to position Pearl within the pantheon of electronic drum giants in the years to come. Though relatively new, Pearl is producing some exciting and innovating products that you should definitely check out if you are looking for an electronic drum set. Yamaha has proved, with it’s DTX line of electronic drums, that the acoustic drum giant can also hang with the big boys when it comes to electronic drums. From the affordable and portable DTX400 series, to the powerful and customizable DTX900 series, Yamaha offers a wide-variety of electronic drum sets and accessories that will not disappoint. Years and years of drum-making experience can’t go wrong, so do not overlook them in you search for your perfect electronic drum set! Regardless of which of the aforementioned electronic drum sets you choose, know that you are choosing from an unmatched lineup of available sets. The big questions you have to ask yourself are what your budget is, and what features you can't live without. There has never been a better time to buy electronic drum set and we hope our list has helped you narrow down the best set for you! Happy choosing!